Here’s the “secret sixth” book giveaway in my week of book giveaways! It’s specifically for my loyal weekend readers (considering I almost never publish on weekends). 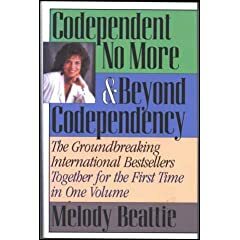 The book is “Codependent No More & Beyond Codependency” by Melody Beattie. This is actually 2 books in 1, and an excellent resource. How to stop controlling others and start caring for yourself. I had a codependent relationship back in college with a former girlfriend. I let my need to help her overwhelm me and I lost track of myself. My intentions were totally pure as I thought I was helping her, but really, looking back, I was trying to control her life. I would tell her what she needed to do and get very upset when she wouldn’t listen. Eventually, she met another controlling guy who took her off my hands and a big weight was taken off my shoulders. Sorry, this contest is closed. And the winner was JD! JD was trying all week to win a book and he finally did. I’ll be shipping out the book tomorrow JD! Entering this contest is very simple: Leave a comment on this article by Monday, July 21st, 2008 at 8am Eastern. Hoping to get lucky again…….from your faithful reader. If my wife read this, will she get the hint? Sounds like this could be a great win indeed…love to read!!!! This would be fantastic, I hope you pick me! Is it possible to be codependent on your kids? Based on your description of the book and what it involves, I think I might be. I think I need this book. I promise to give it back to the public once I’m done reading it! I’m writing a book to help stepparents. The whole idea of learning what you can and what you can’t control is essential to family harmony. Stepparents often think they are helping, when they are actually trying to control. This book sounds like it would be perfect for reference info. Yes, I seem to put my friends first before me then realize they depend on me! UGH! Once again, please enter me in your book give away contest. What a wonderful way to start the week- if I won! Make me a liar! I NEVER win!